Save SAR 210 (70.23%) – Earn 8 Shukrans What is Shukran? Shukran is the Landmark Group’s award-winning loyalty programme in the Middle East, which allows you to earn Shukrans when you shop any of our brands. 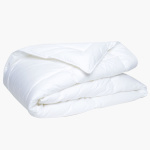 Warm and cosy, this lovely quilted duvet will keep you comfortable while sleeping. Simple yet elegant, this piece will add a bright touch to the room as well.